You can imagine the joy in our house now that we are eating bread again. However, we are limited in our joy simply because I can't get my hands on a good quantity of grains to keep us in regular supply (though that is about to change). Azure, most of the time, is out of any grains I order. So that is hit or miss. And I only get to try once per month; long time in between orders. I was able to buy 3 pounds of hard white wheat from a friend. That went quickly, yet successfully. Next week, I will be receiving an order from Hummingbird Wholesale in Eugene. This is very exciting and I will tell you why. They carry emmer wheat from Bluebird Grain Farms. This is an expensive grain, but Hummingbird's price is lower than the commercial price. I called the farmer to inquire around a month ago. She was very friendly and told me that they have heard of gluten-intolerant folks eating emmer wheat successfully. It is an ancient variety; older than spelt or kamut and definitely older than today's wheat. Its gluten content is not as high as today's wheat. She told me that their customers have more success with bread baking when using a hotter-than-normal oven. It is true that the sprouted grain loaves do not rise as high and seem more fragile. Especially spelt which is just gloppy as a dough. It feels too wet, yet, if one adds more flour, the resulting bread will be too dry. This applies to using regular spelt flour as well as sprouted spelt flour. However, even adjusting for the increased fragility, the bread is soft, delicious, tasty and satisfying. We're happy! Soak 4 cups of berries overnight in clean water in a 1/2 gallon mason jar. In the morning, drain and rinse two times. (Using a sprout screen and metal lid is very helpful in the rinsing process.) I do at least two of these jars, in order to yield enough flour for three loaves of bread. Lay each jar on its side and allow to sprout for one to two days, rinsing morning and night. They are done sprouting when there is a smidge of a sprout tail visible, about 1/8 inch long. Thoroughly rinse and drain, then spread about 1/4″ thick on dehydrator trays (you may need a liner if the holes are very big). I need four or five dehydrator trays for the two jars full of berries. Dehydrate on the lowest setting (95 degrees Fahrenheit) for about 8 hours or less, until the berries are fully dried. To test dryness, taste one. Is it hard and crunchy or does it still feel wet and soft? If it crunches, it is dry. Now get the sprouted and dried berries off the trays. If using a flexible tray liner, you can roll it up a bit and then pour the berries into a clean cotton pillowcase. Or if you're sliding off the tray, put the corner of it in the pillowcase and carefully transfer the berries into the pillowcase. It is possible to use one's oven and oven trays to do the drying. Spread your berries on baking trays and set the oven to the lowest temperature (preferably below 200 degrees Fahrenheit). Leave the door cracked; turn and check the berries frequently. The sprouted, dried berries can be ground into flour as normal. Use your grain mill or high powered blender (such as VitaMix dry container or BlendTec). In the VitaMix (and probably BlendTec, too), grind no more than 2 cups of sprouted berries at a time, on HIGH for 1 minute and 19 seconds. Transfer each batch of flour to a large glass bowl. Use in bread or let cool completely before storing in an airtight container in a cool or cold location. 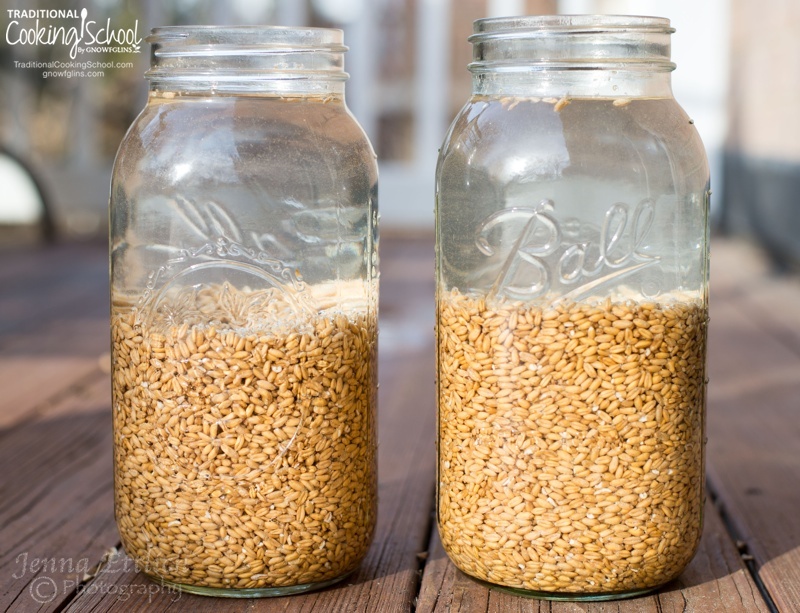 Have you tried sprouting grains or making sprouted grain bread? Please share your experiences, advice or questions. I just read Nourishing Traditions and I really want to try doing the sprouted grains. I have not ever done my own sprouts. I have much to learn but I am looking forward to it! Thank you for sharing your experiences. Hi, I am so glad the sprouted wheat is working so well for you and your family. It was hard enough for me to give up sugar, but to have to give up wheat as well would be so HARD! I have used sprouted wheat to make cookies, they turn out great, I really like them! You can also use sprouted wheat to make pie crust, that is good as well. I tried sprouting wheat just last week. I sprouted the berries for two days, strained and rinsed them several times. They sprouted and I immediately placed several cups into my food processor and processed it for several minutes. Then I added the rest of my ingredients, let it rise and baked it like normal. It turned out wonderful. I was unsure of using the food processor and the sprouted wheat was still wet, but it turned out great. I had about 2 cups left over, I made sure I drained it well and placed in the refrigerator. The sprouts grew a little more and I made cookies with those tonight. They are delicious. This was all a new adventure for me. I was hesitant because I thought it was too difficult, but it was really easy and tasty. I want to try drying them now, but I don’t have a dehydrator I will try it in my oven I quess. Would you be willing to share your recipe and perhaps give more details? Thank you for taking the time to journal your experiences! What a help for others who are attempting to walk this same path. God bless you! I have sprouted wheat, kamut and spelt and dried it on large screens in my oven before milling. I was pleased with the results. Have you heard any studies about the content of gluten still left in sprouted grains? I am curious as we are having gluten problems and I’m in the process of getting all of us off gluten completely. I have not read any specific results. I would be interested to find some. Since breads from sprouted gluten-containing flours develop the stretchy gluten-network when kneaded, I am inclined to think that the gluten is still very definitely present. However, it seems to be “pre-digested” through the sprouting process, which makes it easier for gluten-sensitive folks to handle. You say members of your family are having gluten problems — is this still true with sprouted gluten grains? I too love the results of sprouting grains. It is about the most exciting thing to happen in my kitchen in a long time! 😀 We are very thankful to eat bread again. I would love to hear more of your experiences. We have been reading an article that says it isn’t the gluten that is the culprit. The article says that it is the Roundup that they use to get the plants to die faster that is causing all the health problems. It really helps with the harvest, but is soo bad for human consumption. Wow, I’m fascinated with Michelle’s ‘skip the drying’ technique – I would love to hear your thoughts on this….. I read the other day where white flour is made up of the starch part of the wheat berry, and it’s the reason for the light and fluffy component white flour brings to baking – sooooooo would adding gluten free starch like tapioca starch to one’s bread, like whole wheat bread help? I’m wondering because all my attempts at bread turn out to be lovely rocks! Can I try this sprouted bread with the wheat I got from HW? Should I add anything else to it to make it not so heavy or wheaty, or …….. (gulp) rock-like? That’s a very good question! I have never heard of anyone trying to add tapioca starch to bread (other than gluten-free). By your question, it seems like you are talking about whole wheat bread. If I run across any information about it, I will pass it on to you. I don’t remember you getting any wheat from HW? But yes, you can try sprouting any wheat-like grain to make this bread. I’ve done spelt, kamut, emmer, and hard white wheat. The spelt turns out the nicest! Since now I know you’re referring to buckwheat, this is not a grain I would sprout for this bread. You purchased the buckwheat with hull. I have some without hull if you’d like to try the breakfast method. We can arrange to have Jeff bring you some; I have plenty! Oh Wardee, your so wonderful…. after you were here and explained this buckwheat, not being wheat (food is soooo not my thing) and the hull thing about it… I was inspired (again 🙂 So while getting out my wheat berries for sprouting (first time ever) I ran across a jar with seeds you sold me months ago – and guess what? Un-hulled buckwheat was in there (I know because you pointed out what buckwheat looks like – LOL to me! So I have some un-hulled to play with – I have other seeds too (don’t know what they are, but you told me they were all for salad sprouting – yeh! I read last night, where a person puts un-ground sprouts of all kinds into regular flour when making bread. That sounded interesting, along with seeds and nuts. So it looks like the possibilities for experimenting will continue. Thanks for all your help! There is a company that makes and sells spouted grain flours. It is Summers Sprouted Flours and the website is creatingheaven.net. I have used their products before and really like them. Their phone number is (505)384-0337. Cheryl – Yes, I agree with you, completely. I have switched to using a cotton pillowcase. It has an opening big enough to fit the trays from the dehydrator. vehement flame – I wouldn’t recommend my dehydrator. It was given to me, so I’m using it. But everyone I know who has a good one buys an Excalibur. (See Resources for sources.) I would like one of them myself; just waiting for this one to bite the dust! The emmer is fun to use, but I always get better results with spelt. I love the idea of emmer being so ancient, and varying our grains, so that’s why we use some of it, too. I don’t think I’ve ever used durum wheat berries, where do you get yours? Thanks so much for all of your tips and for having this blog. You have been a life saver! Kimbrah – You should definitely use whatever you have. A glass bowl and colander work great. You can grow your sprouts right in the colander, too. I’ve done that before. I hope you’ll share how the bread making goes when you skip drying. I haven’t been too successful at it, but want to make it work. Do you think you could dry them on a low temperature in an oven if you don’t have a dehydrator? .-= Rebecca´s last blog post… Ginger Snap Granola =-. Rebecca – yes, you can! Keep the temp as low as you can, in fact, perhaps turning it on and off intermittently to keep it warm but not hot. Let me know how it goes! I faithfully read your posts, but have yet to try sprouting grains. I think it would work well for my son who is gluten-sensitive. I am nervous though, and I can’t emphasize that enough! I think that I am almost ready. My MIL has a fancier over and I think I could set the temp at 95 degrees (I don’t trust my oven to maintain any temp. for more than 1 hour). Would wet, sprouted berries travel well? Or should I wait for a trip when I could do the entire process (they live 2+ hours away)? My second concern is grinding the berries. I have a food processor, would that work? How long does the entire process take, from beginning to end not necessarily active time? Hi, Jessica! Since you are nervous, and anything like this is worth testing carefully, try him on small amounts and observe for a few days before trying him on more. The wet sprouted berries will do fine for 2 plus hours. Can you pack them in a cooler? Time it so that they are done sprouting right before you leave, rinse them well, pack them in an airtight container. The cooler will slow the growth (but not stop it). You shouldn’t even have to rinse again unless it has been 8 or more hours. I don’t think a food processor would give you a fine enough grind. However, you could do small batches in a coffee grinder. Is that an option? Hope that is helpful! Please let me know how it goes or if you have more questions! Thank you for your comments Wardee. We do have a coffee grinder, so that is a great option for us. When you make flour, how many cups of berries do you sprout & grind, and what is the yield? I think I will limit myself to 2 cookie sheets of berries for the dehydrating process, but maybe less depending on the expected yield. Are you still following the Artisan Bread recipe you posted or are you exclusively baking sourdough? I really want to try sourdough bread but might start with one project at a time. How is your sourdough starter? I hope that is going well for you. You continue to be such a blessing! Thank you for sharing your experiences! Jessica – I grind two cups of berries at a time (that’s what fits in my Vita-Mix) and I figure it yields me 2-1/2 cups of flour, give or take. That helps me know how much flour to grind. Now how to figure out how many berries to sprout. Well, they pretty much double in size. So 4 cups of raw berries ends up to be almost 8 cups sprouted. Since I’ve been experimenting with sourdough, I haven’t been making my artisan bread. I don’t want to do baker’s yeast breads anymore. Here is a link to a recipe from Girl Gone Domestic, for the artisan bread done sourdough style. I want to try it sometime, to see how it works with sprouted flours. http://macmama.wordpress.com/2009/06/18/easy-no-knead-sourdough-bread/. Perhaps you could try it later, after you master/test the regular artisan bread recipe. My starter is thriving. The breads keep turning out better and better, though I am still trying to get it right. Everything is more than edible though! More than! I keep using sprouted flours in muffins, cookies, cakes, etc. It is wonderful! (1) If we had sprouted and dried the grains but do not intend to use it immediately, do we store in an airtight container? Does it need to be refrigerated? (2) If we had done (1) above and also ground the grains to flour but do not intend to use immediately, how do we store? JK – The sprouted flour is shelf stable for six months in an airtight container, and longer if refrigerated or frozen. I don’t know about the whole sprouted grain, but certainly it would be at least six months, based on the flour storage requirements. This information comes from “Sprouted Baking” by Janie Quinn. She says that sprouted flour is more shelf stable than unsprouted, because the grain’s germ undergoes a transformation during sprouting. Prior to sprouting, the germ contained the fat, which is susceptible to rancidity. HOpe this helps. I have commented a couple of times and just wanted to say thank you for the encouragement to sprout grains. I finally did it and it is so much easier than I had imagined. One neat thing I stumbled on for drying out the grain without a dehydrater or oven is the sun. Obviously it won’t work any tiime it iis not pretty warm and dry, but it does save on electricity and if a person has a pizza stone of some sort I found that it dries out even so much quicker with the stone absorbing moisture and retaining heat. I don’t know exactly what I will use with summer on the way out, but I will see how long it will work. I’m so glad to see your directions here- I’ve been thinking about doing this when my dehydrator is finally free of summer fruit & veggies so I’ll clip these instructions. My family doesn’t like the flavor of soaked grains so we’ve fallen off the wagon but if I can soak & grind they would never know. .-= Sustainable Eats´s last blog post… Blackberry Juice =-. Annette, what is it about the soaked flour taste they don’t like? It’s the sourdough’y taste, that fermented flavor that it gets. Pancakes just aren’t as sweet if you soak overnight. The raised bread I am soaking and they are fine with that but the scones, muffins and cookies (basically all the things we shouldn’t really be eating but childhood demands that we do) are the things that taste “different” when soaked overnight. .-= Sustainable Eats´s last blog post… You Say Catsup, I say Ketsup =-. Annette – I hope you’ll be able to try this. It might be perfect! I tend to use sprouted flours for most of my muffins, cookies and cakes – it is not only convenient but very tasty. In fact, no difference in taste. But have you tried soaking with Kombucha – nothing ends up sour if I use that for soaking. It might be worth a try. I noticed that you referenced gluten grains but someone in the comment section said that they wanted to sprout buckwheat. I’ve soaked buckwheat and it’s fantastic. Can you sprout non-gluten grains? Quinoa, brown rice, millet? Wardee, love this site! I am fairly new to sprouting but have found a sprouted rice and quinoa blend as well as a three bean trio at Costco from truRoots. I am currently in the process of dehydrating my first ever batch of sprouted wheat berries. I read somewhere to use tulle in the dehydrator trays (a light color other than white), and so far so good. I thought that might be helpful for some folks and make it easier to “retrieve” the dehydrated sprouts. It might just work for sprouted quinoa! Ive managed to sprout Quinoa in my Biosnacky jar, soaked for a day and they sprouted within 12 hrs! In January of 2010 I started sprouting wheat and baking bread, biscuits, cookies, pancakes, banana breads, carrot cupcakes, pizza, etc. . . At the end of the year I have lost a total of 50 lbs. I attribute it all to eating sprouted wheat and and sprouted spelt. I have more than one serving per day. Hi Wardee! I read this, along with all of the comments, with much interest. 🙂 Did you stop making bread like this altogether in favor of making sourdough breads now? I wonder if Whole Foods sells bulk sprouting spelt berries. If they have spelt berries at the store, are those the ones used for sprouting? Or do you have to have special sprouting berries? Hi, Robin! Nowadays I use my sprouted grain flour IN sourdough bread. The whole spelt berries are the berries to sprout. Same with wheat. If you buy the whole berry, it will sprout. I love sprouting spelt! My daughter is gluten-intolerant too but can handle sprouted flour fine. I just leave mine in big plastic bowls to sprout, then rinse and keep in a colander over a plastic bowl. In the summer I have to be very diligent about rinsing or I’ll get fuzzy mold (in the winter it didn’t seem to matter). I have a recipe on my blog for bread that has NEVER failed. I get a high, beautiful rise and delicious, soft bread no matter what type of flour I use. It’s called “Dairy-free whole grain bread” and can indeed be made with butter or coconut oil, whole milk or a milk substitute. It’s wonderful and I can’t wait to make a loaf with the sprouted spelt anyday now. I tried your suggestion about grinding a bit longer and finally got the texture of flour I was looking for! Thanks! .-= Kate @ Modern Alternative Mama´s last blog post… Creating a Meal Plan: Breakfasts and Lunches =-. I use Chia on a daily basis and just learned about it potential “anti-nutrient” property. You mention that sprouting takes care of this potential problem? If so, to what degree? How to sprout Chia since it has the gelatinous quality? And when Should I stop the sprouting process to get the highest nutrient levels and lowest anu-nutrients? If I recall correctly, I can put the sprouted seeds in an oven at 105 degrees and dehydrate them. Will this work with Chia as well? Perhaps this article at sproutpeople will be helpful: http://www.sproutpeople.com/seed/print/chia.html It has directions for sprouting to greens. You would have to experiment with whether it is doable to get the seeds on a tray in the oven at any points in between. Sprouting greatly reduces the anti-nutrients, but not all the way. I presume that the longer something is sprouted, the greater reduction in anti-nutrients, but I could be wrong about this. Or one can use sprouted seeds in sourdough for even greater reduction. David what do you use Chia seeds in? I have some and would like to incoorporate them into my family’s diet but I am not sure how. Hi, I would like to learn how to make sourdough bread using sprouted wheat flour. I would first need to make my own starter. Can you help me with some recipes for both the starter and sprouted wheat bread. I have heard that sprouted flour digests as a vegetable, not a starchy carb. 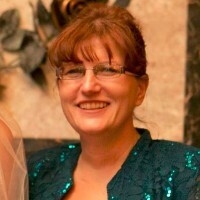 Helen — Those are the things I teach within the classes at GNOWFGLINS eCourse. We have great directions for starting your own starter, as well as sprouting grains. Then you can use the sprouted grain flour in any sourdough recipe. do you have to grind the dried, sprouted berries right away, or can you store the grain to then fresh grind on demand? Annalise — Definitely you can store the whole sprouted berries! In fact, that’s what I usually do. Sprout and dehydrate a whole bunch of berries, then dump them into a pillowcase. I keep that in the pantry and grind the flour as I need it. Sprouted berries and sprouted flour are both pretty shelf-stable, but the berries more so. Hi! I have been experimenting with soft white winter wheat (newbie). I soak and sprout until sweet (about 3 days). I would rather cook or dehydrate the breads from the sprouts directly instead of dehydrating them and then grinding them into flour so I just mix the sprouts in a food processor or Vitamix. Here is the problem, if any of the grain is left whole when baked in an oven at low temps (~ 250) they are hard as a rock! The inside is delicious, caramel colored, sweet, and chewy, yet the outside is quite hard because the whole grains tend to rise to the top. I have read that you can leave a pan of water in the oven, this I haven’t tried yet. I have also tried dehydrating the dough (< 118). It is also quite nice and VERY different from the cooked version. It is more white in color and has a different flavor, not as sweet and rather like oatmeal. Neither are perfect yet, what I really want to do is grind the sprouted grain so that no whole grains are left. My tools are an OK food processor and a Vitamix. The food processor works the dough better however not enough grinding power (or maybe I just need to grind it longer). The Vitamix balls up and will overheat with too much grain. Any ideas? My next batch I will probably try the Vitamix in very small quantities. Also, I have a question, is sprouted wheat no longer a gluten? Hi Tara, ive been baking whole grain breads for a couple of years. One of my bread recipes uses soft white wheat berries in the dough. Occassionally i get a crunchy berry in the loaf, i dont know what causes it. For the most part, it is one of the softest breads i make. I use whole wheat flour and am looking to experiment with sprouted grains in bread. Some hints: i bake at 350 degrees on a pizza stone (upper rack). On the lower rack i have a cast iron skillet that i carefully pour a cup of water into when i pop the bread in so that it steams for the first 10 minutes. You dont want to have stream the entire time since that affects crust development. Oven should be hot when the bread goes in and the dough should be warm (i.e. All ingredients were at room temperature). Soft white winter wheat is generally used to make cake flour, it has the least gluten of all the wheats. Since you are new to this i suggest you try red hard spring wheat. Its highest in gluten. Not enough gluten will keep the bread from rising enough, which leads to bricks. The steam helps with “oven spring” as does the hot oven. That will help get you a lighter loaf. Also putting the dough in the frig overnight will help with gluten development, it also sweetens the taste. Also i put a little vitamin c in my dough, it helps repair the gluten that the berries tear. Thats made a big difference in my baking. I hope this helps you. I am so glad i found this site. There is so much interesting info and im so happy to find other people who love healthy bread. Thank you Wardee for putting this excellent site together. As I understand it, if you are using a sourdough startrer there is no need to presoak the grains. I start my bread the night before and bake sometime the next morning. This means the flour is getting the soaking/fermentation that is needed. This really simplifies bread making. If you ever come up to Portland, People’s Co-Op on SE 21st between Division and Powell seems to always have great grains in stock. I buy spelt berries, wheat berries, quinoa, barley there to sprout and also grains I have a hard time finding other places, like einkorn and emmer. Why worry about the heat when drying if you’re going to bake it anyway? What a wonderful post; just sorry I didn’t read it much sooner. But, even as life is a journey, so is learning about traditional/whole/natural foods and better ways to prepare them. Thank you very much for this journal entry, Wardeh. 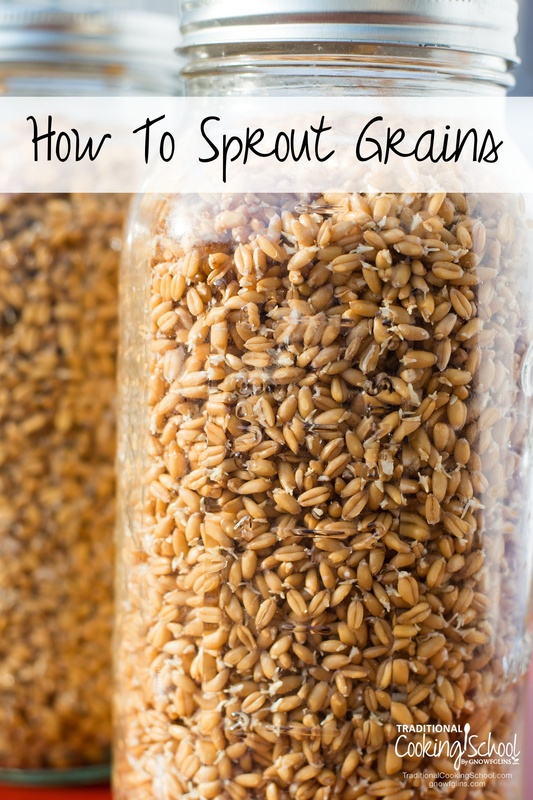 It was so fun to see this post today because I just finished a big batch of sprouted wheat berries this weekend and have bread in the oven right now. About a year ago we invested in a grain mill and have slowly been experimenting with using fresh ground grains. We had a lot of trouble getting good loaves of bread until we tried sprouting our grain first. We live in northern Montana and are surrounded by wheat and barley fields and it is nice to be able to utilize such an abundant local resource. Have you tried http://www.wheatmontana.com for sourcing grains? I don’t know if they carry emmer wheat but what they do carry is very high quality and reasonably priced, not to mention they work closely with Montana farmers to ensure the best environmental practices are used. I just recently got your book and have been enjoying it immensely, thank you! They’re probably okay – try sprouting them a bit more. If they aren’t sprouting after another day or two, dry them. i have tried sprouting spelt and not all the grains sprout. Would I continue on to the next step and dehydrate when I see at least 1/2 of them have sprouted? That should work well. 1/2 to 3/4 is usually what I end up with. Hello. I soaked my hard white wheat berries will some raw apple cider vinegar, will the vinegar interfere with the sprouting process? We’re not really sure about this. It might, but you could still try to sprout them. Whisper Mill’s instructions say you are not suppose to mill soaked, sprouted, dehydrated berries. Has anyone tried this in their WM. Thanks and thanks for this wonderful tutorial! To experiment with sprouted grains, I sprouted just 1 cup of organic hard red wheat, laid it out on a flour sack cloth on a cooling rack for 4 days checking for dryness by eating a few kernels every day. Then I whizzed it into a fine flour in my Vitamix dry container. It made 1.25 cups of sprouted flour and I was elated. I found a YouTube video of a homesteader who sprouts and dries wheat to bake bread, and reduced her recipe to make 1 loaf, used 1 cup of my sprouted wheat flour and 1.5 cups of half bread flour and half all purpose flour. I did a test loaf with 1 cup of store bought sprouted wheat flour and 1.5 cups of the same bread/all purpose blend. I read that sprouted flour needs to soak water longer so I did that before adding the supplemental flours to my doughs. I made them the same, and apart from a table spoon or two of water added to make the store bought flour dough, and adding a couple small handfuls of the flour blend to the home sprouted dough, to get the correct consistency, they were identical (weighed exactly the same too). I saw that my home sprouted loaf didn’t rise as much and felt more slack even after the first rise. They baked in a 350 degree oven for 30 mins, and the loaf made with store bought sprouted flour rose significantly higher, but the home sprouted loaf also rose a decent amount so I was satisfied. But as soon as I removed them from the oven, the loaf made with home sprouted wheat FLATTENED! When I saw that it was starting to sink, I grabbed an instant read thermometer and measured the internal temp, 210, which means it should be done/cooked. It had stuck a little on the end to the pan (buttered) so it didn’t slide out of the pan, and I used a knife to free that end. But to my dismay, it kept sinking and sinking until it flattened into 1 inch tall. The test loaf is one of the tallest loaves I’ve ever baked. WHAT COULD HAVE GONE WRONG? Was it too slack? Was there too much enzymatic activity that interferes with setting of the gluten? The recipe called for a touch of honey, could it have been that? I added an egg to each loaf, could that have messed up the balance? Not enough gluten formation? My sprouted wheat, as soon as I mixed in the water, smelled grassy and fresh. I figured it’s a good thing…is that a bad indicator? Was it not dry enough when I ground it? Any ideas would be helpful! I was thinking of going out and buying more wheat to sprout, dry and make into my own flour. Now I’m not so sure. HELP! Wow! Great job testing out your sprouted flour! I’m not exactly sure what might have gone wrong in your experiment, but I don’t think it had anything to do with the honey or the egg. You might be onto something with the gluten formation, as sprouting grains will break down the gluten in them. Sprouted flour can definitely yield drier, more crumbly baked goods. It seems that most of the Traditional Cooking School recipes that use sprouted flour are cookies or quick breads, such as muffins. Wardee prefers to use a sourdough starter with non-sprouted flour for actual bread-baking — probably because the starter provides natural leavening that better enables the bread to rise (and stay risen). You might give sourdough a try to see if you have more success.